What Is The Best Bosu Ball Workout? What is the best Bosu ball workout? Learn more from our forum members as they describe effective ways of using the Bosu ball, the original inventor, personal experience and more! TOPIC: What Is The Best Bosu Ball Workout? The Bosu Ball is a unique device used for a number of different reasons. This great tool can be especially useful for football players looking to gain an edge. What Is The Best Bosu Ball Workout? Be descriptive: List exercises, sets, reps, frequency, etc. What other sports would this be useful for besides football? Why? When was the Bosu Ball created and who was the original inventor? Bonus Question: Have you used the Bosu Ball in your training routines? Was it effective for the purpose it was designed for? 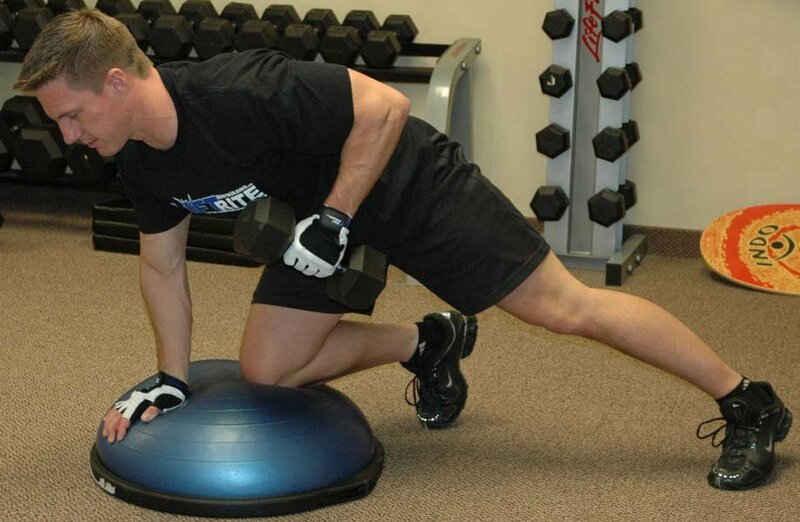 The BOSU ball is an effective tool that can be utilized by a wide range of athletes. The BOSU acronym stands for "Both Sides Utilized," although also sometime referred to as "Both Sides Up." It consists of one side that is completely flat, and can lie flat on the ground. The opposite side is the ball side, which is essentially an exercise ball cut in half. The BOSU ball can be important when training for balance. When using the BOSU ball, your body is forced to recruit numerous core and stabilizing muscles in order balance. Many football teams have begun to use the BOSU ball in order to gain an edge on their competition. This allows them to develop their core muscles and improve strength and balance like no other exercise would allow them to. The BOSU ball is great for building the core muscles, however not all exercises need to directly target the core. Many other exercises indirectly stimulate the core muscles, leading to better balance and explosiveness. Follow the following program and watch your balance and core strength reach new heights. Make sure to stretch thoroughly, and perform a quick 5-10 minute cardio warm-up to help prevent injury. WARNING: If this is your first time using the BOSU ball, I recommend you try to balance on it in order to get used to it, and prevent falling off during the actual exercises. Perform the squat by placing both feet on the bubble side of the ball (although it can be performed with the bubble side down), as wide as possible on the ball. You may not be able to achieve shoulder width due to the surface area of the ball. Once you are set, descend slowly until your thighs are at least parallel with the ground, and then push back upward in a controlled motion. If 3 sets of 10 reps is too easy for you with no weights, add dumbbells to make it even harder. The squat will utilize an incredible amount of stabilizing muscles, and is the best place to start. 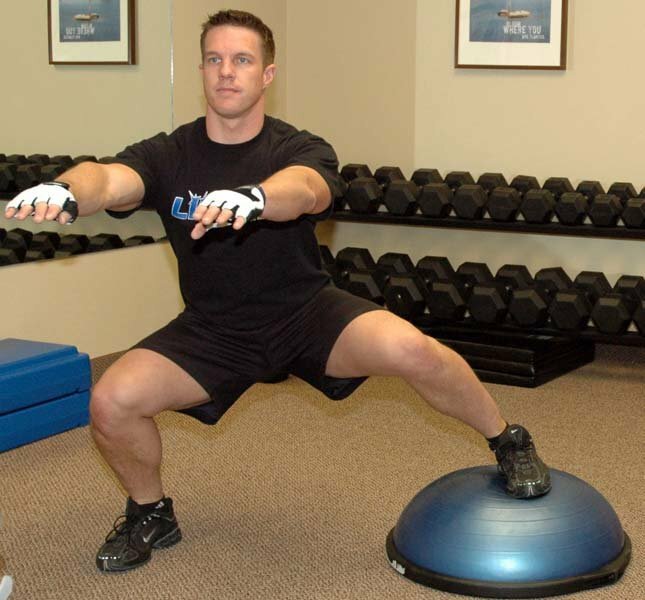 The step-up will be performed with the BOSU ball in the same position as it was for the squat. Place one foot on the center of the ball, and then step-up and bring your opposite leg up until the thigh is parallel to the ground. This may be difficult at first, but once perfected it will enhance your balance greatly. This exercise is performed with the bubble side on the ground. Place your hands on the outer edges of the flat platform, making sure they are directly under your shoulders. Making sure to maintain a flat back, tighten your abdominals throughout the workout. Descend until your chest is close to the platform, and then slowly push back up. Perform one set until you cannot go any more, making sure to keep proper form the entire time. Once you complete your first set, rest for one minute and repeat. The bridge will be the first exercise that directly targets your core, once you have pre-exhausted it somewhat already. This is performed by placing your elbows on the bubble side of the ball, with a flat back and tightened abdominals. Hold this position for a full minute, and then relax. After a rest period of only 30 seconds, attempt to do it again. Note: Beginner's can start at 30 seconds if one minute is not attainable. The bicycle will be the final workout in your routine, and the most demanding. Begin by lying on the bubble side of the ball with your lower and middle back centered. Then place your hands behind your head so that your elbows are pointing straight outward. Then bring your legs off the ground and take your elbow to the opposite knee, alternating until you cannot go any longer. Then rest for one minute, and do it again. This will conclude your workout. If you become advanced enough you can add in some of the following exercises, or simply use them as substitutes. Click Here For A Printable Log Of This Bosu Ball Workout. This is performed by getting on all fours with your hands on the ground, and your knees on the bubble side of the BOSU ball. Then lift one arm and the opposite leg simultaneously and extend until completely straight. Alternate arms/legs for a set of 8-10 for each arm/leg. The basic crunch is performed by lying with your back on the ball, and your feet flat on the ground. Then proceed to complete a crunching motion, and return to the initial position. 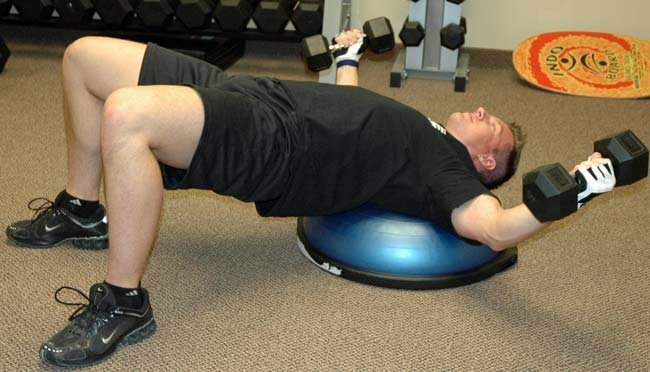 The ball will allow you to get a greater range of motion for your abdominals. Complete at least one set of 30 crunches, or as many as you can do. This exercise is done with the flat portion of the BOSU ball on the ground. Start with both feet on the ball. Take your right foot out and into a side lunge, then explode up, replace your left foot with your right, and repeat on the opposite side. Do three sets of 8-10 reps for each leg. The BOSU ball is an effective tool for football players. 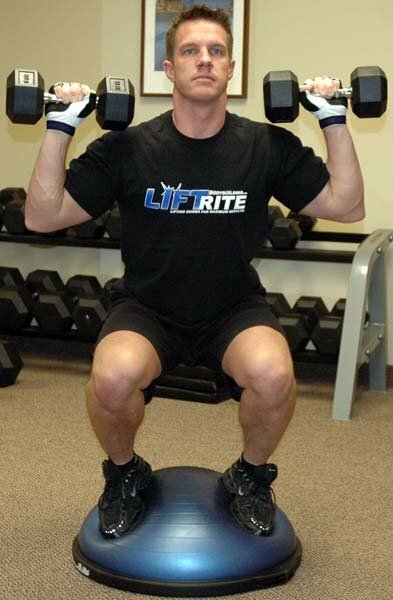 It allows them to enhance their balance, core strength and explosiveness. This will translate to better performance on the field, while they will be better prepared to turn on a dime and make explosive moves without going down. Football is not the only sport in which athletes can benefit from this great exercise tool. This would be beneficial for any sport in which balance is necessary to performance. Being able to balance and move back and forth will enhance your agility greatly, and this is certainly beneficial to many more sports than just football. Some of the obvious ones include soccer, basketball, baseball and even hockey. The strengthening of core muscles will improve the performance of athletes in these sports greatly. One sport that may be over looked would be boxing, MMA, or other various types of combat/fighting such as martial arts. Balance is key in these sports, and the enhance core strength will greatly improve these athletes abilities. The BOSU ball is a beneficial tool for many athletes in many sports, and also the average person looking to improve overall health and performance. "It was a Friday night in 1999. The Knicks had just lost game seven of the Eastern Conference Finals and I had taken another nasty spill jumping on my stability balls. As I lay in bed contemplating how I could continue to Bounce On Something Unstable and thus continue to feel the amazing results in my body - like no more back pain and no more pain in my feet first thing out of bed, I had an Ah-Ha moment and an Idea was born." Have You Used The Bosu Ball In Your Training Routines? Was It Effective For The Purpose It Was Designed For? When I played football in high school we used the traditional exercise ball all the time. It was pretty effective the way we used it, but there were certainly numerous safety issues which didn't allow us to use it to its full potential. We did plenty of abdominal work and stabilizing exercises. During my last year of high school our high school received a large order of BOSU balls. We incorporated them into our off season routine. Personally I feel I benefited greatly from them, as my abs, although not extremely visible, are strong. This is good for general health reasons and protection of back injuries. It helps me with many other exercises as well, such as the squat. Since football, I didn't use the BOSU ball as consistently as I would have liked to. I have recently begun to incorporate the BOSU ball into my routine again. Since I am not currently competing in a sport, I use it mostly for direct abdominal work. I usually do not feel much soreness in my abdominals after a workout unless I use the BOSU ball. It allows my abs to get a great range of motion, and really stretches them out. I feel this ball is essential for my abdominal development. Good luck with your goals, and if you have any questions about the routine you can contact me at Piscitbj@muohio.edu. I would be more than happy to assist you further. The best Bosu ball workout is one that incorporates a variety of exercises that will improve strength and balance. I like to do full body workouts on the Bosu ball three days per week: Monday, Wednesday, Friday. If you are just beginning a Bosu ball workout then you may want to start with just two days per week, such as Tuesday and Thursday. Unless otherwise noted you should aim to perform 3-4 sets of 8-10 repetitions for each exercise. If you find you cannot begin with this many repetitions then don't hesitate to work with your current conditioning and drop them down to a number you feel comfortable with. Warm Up: you can warm up by using the Bosu ball to jog in place. This is a great way to get your body ready for more strenuous exercises as well to improve balance. Not only does this minimize the chances of pulling a muscle but it also gets you more comfortable with the balancing challenge presented by the Bosu ball. Warm up for about ten minutes before proceeding to the exercises below. Squats: with your legs thoroughly warmed up this is a good time to go straight to an exercise such as squats. Stand with your feet spread evenly and your arms either by your side or held straight out in front of you. Squat down until your knees are parallel. Deep squats on the Bosu ball can be difficult and cause you to lose your balance so it is best not to attempt this. Push back up and repeat for 8-10 repetitions. Do 3-4 sets of this exercise total. Squats With Overhead Press: this exercise should only be advanced to when you feel comfortable with basic squats. Take a pair of dumbbells, although not too heavy, and hold them at ear level as if you were about to perform basic dumbbell presses for the shoulders. When you push back up on the squat, press the dumbbells overhead, paying careful attention that you keep your back straight. This exercise should replace the above squat exercise once you have grown accustomed to squatting on the Bosu. 8-10 repetitions and 3-4 sets should be performed although you may need to take an additional minute of rest after working two muscle groups together. Push-Ups: for this exercise you will need to turn the Bosu ball upside down with the platform facing up. Make sure your chest is directly over the middle of the platform with your hands gripping the side of the platform. Lower your body like you would while performing a standard push-up and then slowly push yourself back up to the starting position. Do 8-10 repetitions and 3-4 sets. 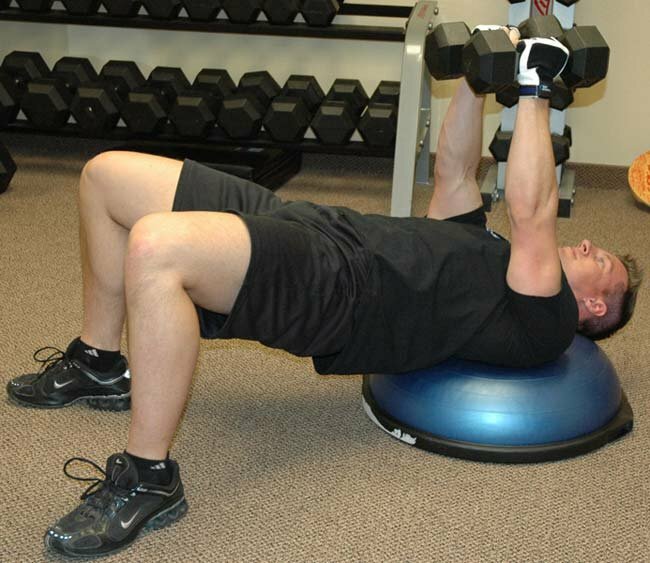 Dumbbell Row: kneel down with one knee on the Bosu ball and the other either planted on the side or lifted up. Place the hand that is not holding the dumbbell on the floor in front of you. Pull the dumbbell up like you would doing a standard dumbbell row. Do 8-10 repetitions before alternating and reversing the position of your hands and knee placement. Perform 3-4 sets total. Flyes: lie down on the Bosu ball making sure that your neck is properly supported and your back is arched in a tabletop position. Begin with a dumbbell that is not too heavy and your palms facing each other above the chest. Slowly lower the weight down in the traditional arching movement of a fly performed on a bench. Feel the stretch at the bottom before lifting back up in an arching motion. Do 8-10 repetitions and 3-4 sets. The BOSU can be useful for many sports in addition to football. In gymnastics, this could help improve balance, stabilization and strength which are key to this sport. Basketball is another sport that requires a great deal of balance. A Bosu ball could be extremely beneficial for these athletes. Wherever balance is a fundamental aspect of a sport, the use of a Bosu ball could be beneficial to the athletes. 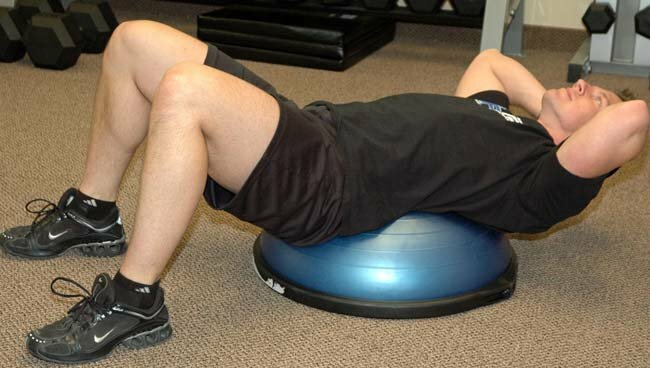 The BOSU ball was created by David Weck in 1999 to help him with recovery when he was having back problems. Yes, I have used the Bosu ball on numerous occasions and I still occasionally perform workouts with it to change my routine up. My brother bought one several months ago because he is always buying new fitness gear that he never uses. I tried using it once when I was at his house and have been using one ever since. I did not realize how poor my balance was until I tried it. Amazingly, this is one piece of equipment you can never truly master so it never gets old or boring. I feel like my balance, however, has greatly been improved as a result of using it. Although I mainly train with free weights I occasionally take a week off from my usual training routine and do a full body Bosu ball workout on Monday, Wednesday and Friday. It's an excellent way for me to change my routine up and do something really different. The Bosu body allows me to work muscles that don't get hit with my conventional training. It's a lot of fun and gives my body some new stimulus.